For over 67 years Wrights Office Supplies have been providing their customers, throughout the North East and nationwide, with over 25000 stationery, furniture and all other office related products. 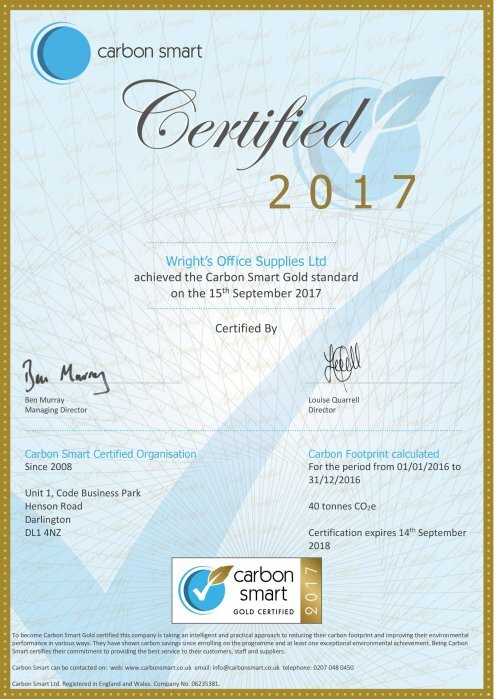 Since 2008 we have been working with the award winning Carbon Smart, a certified organisation, to monitor the impact our business has on the environment. In 2008 our carbon footprint was measured at 46.50 tonnes, by creating a practical and sustainable plan we aimed to reduce this figure. Our 2010 carbon footprint is now 39.50 tonnes. The commitment we made throughout 2010 has given us an overall reduction of 15 %. Even with the fantastic efforts made in our first year, the So Go Eco programme has identified areas we can further reduce this figure in 2010 by another 3%. By January 2014 the target we have set ourselves is a total saving of 18% from our 2008 carbon footprint, using the actions set below. Implement a separate green policy, looking at our fleet and gas use. Collect essential carbon data on a monthly basis to provide more accurate figures. Communicate to all our customers and staff our new carbon footprint. Reduce the packaging we use by recycling all our delivery boxes. Implement an action to change any old equipment, where required, to energy star products. Update our training programme to raise staff awareness of our new carbon footprint, green policy and environmental issues, whilst enlisting their support in improving our company’s environmental performance. We will maintain, update and review this policy on an annual basis.